This might be the first Travel Tuesday of the year that I'm not recapping a trip! Whew, it's been a crazy few months, can you believe it's already March? It's so amazing how quickly time flies. Anyyywayyysss, today's Travel Tuesday is all about the carry on. My go-to right now is my LV pegase which I love, but I travel so much that I'm really finding the need for something more functional. I love the four wheels on my big suitcase and I think having them on a carry on would be awesome. I'm also really digging the hard shell luggage trend. I feel like you're able to fit a lot more into the suitcase and since they're so new, the room for organization is there. I mean if I had all the money in the world, I'd get the LV zephyr 55, which would have everything I mentioned above BUT $3K is way too much to spend on luggage. So I found some other really intriguing options that have met my criteria and are also pretty darn cute. I love the styling on the outside, don't you agree? Which one is your favorite? Ohh I love the first and third suitcases! Very cute! I travel with a silver set of four wheel suitcases and love them. I love the white, but the mint is so so cute too! That mint correspondent is adorable! I just wonder if it would end up getting visibly dirty? 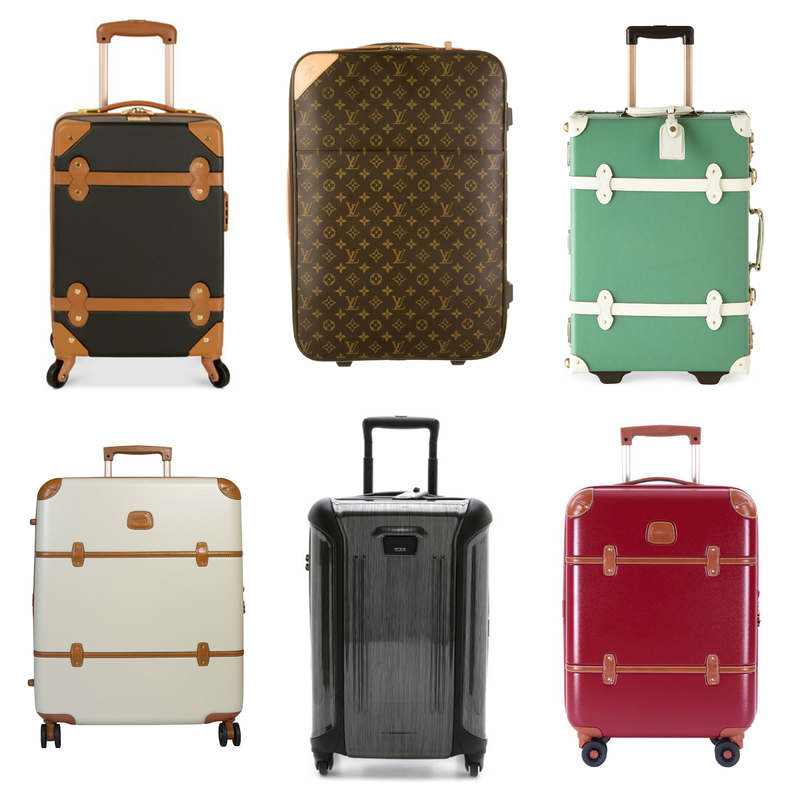 I think an absolute must is the wheels that rotate, my last luggage purchase has the standard wheels and I swore I would never make that mistake again! I've been in search for a great new carry on, these are great suggestions! Kate Spade recently added some new pieces to her collection. The DVF Adieu is beautiful, my go to is always black, it's sleek and beautiful. I like the free one!